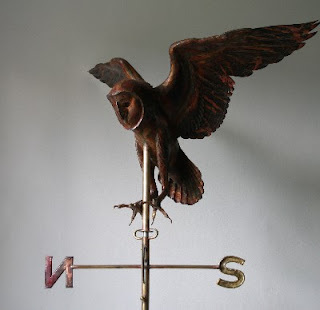 Friend, artist, author and illustrator Jackie Morris first approached us to make a weathervane based on one of her stories, when we still lived on Dartmoor. The story, called "East of the Sun, West of the Moon" was a wonderful retelling of an old Norse tale. I remember being told the story as a child, and especially remember the Kittelsen print of the young girl, so upright, riding on Kong Valemon's enormous back. And why might I be mentioning this now? 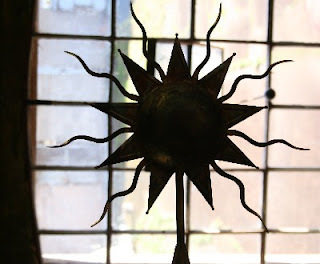 Well funny enough I am working on a Sun & Moon weathervane, so it was intriguing that Jackie's weathervane should pop up on a Google Search....esp. as there is neither a sun or a moon in the design. Jackie's story followed the journey of a young girl who must travel East of the Sun and West of the Moon to save her bewitched lover, who is trapped in the form of a polar bear. The resulting design of a girl riding a polar bear, can be seen on our website or "in action" on this You Tube link. It is interesting to see how the copper has darkened and started to gain a patina. An avid blogger herself, Jackie can be followed on Drawing a line in time. I love her enthusiasm for including us all in her Process: whether that be the studio, the work itself, her cats(! ), her travels, the artists she knows and loves, and all the inspirations that make her work and books so popular. As an exhibitor and demonstrator, she started her video tour of this summer's Best of the Best tent (2011 Art in Action) with our Montagu's Harrier Hawk. Thanks Jackie! I bought J.D. Salinger's The Catcher in the Rye, last year in the hopes of sharing one of my favourite authors with the kids. We even brought it in the Land Cruiser to Cornwall this summer, and still it remained unread. So last week when I was sitting in the truck, glaring downhearted and overwhelmed at the tinstore, trying to work out how on earth (!) we will ever make it work as the studio, it caught my eye. Now I am the type of book reader that is very greedy. I will read through the night, with one eye open if necessary, and miss a good part of work the next day...all for the sake of a good story. But this book is HUGE! Hugely wonderful, hugely life changing. Read it again. Then read it again. I promise you Salinger is a genius. I can't work out how we will ever live without books. How they could be replaced with things like Kindels. To hold a book. To own it, have it on your shelf, to open and close it. Remarkable. "Did the tigers run all around that tree?" "I thought they'd never stop. I never saw so many tigers." "Only six!" said the young man. "Do you call that only?" I am really pleased with this "standard size" version of our Hovering Barn Owl. It is always a challenge to repeat a design. There is the desire to "improve" the original, and to create something fresh...but that is always tainted with a niggling fear that you won't be able to achieve the magic that caught the client's eye in the first place. The brass was cleaned with hydrochloric acid. Pretty nasty stuff, but it has the "bite" to remove the blackened braze site. In this case, the client wanted the cardinal letters (N E S & W) gilded, so the letters were primed with red lead. We use a 12-hour Charbonnel size, and 23.5K double thick, loose leaf English gold. Speaking to master gilder Colin Mullins (who has done work for Anish Kapoor..not to mention numerous historic royal palaces...all the great & the good), he mixes his own size. Colin's work is completely sublime. I have not seen gilding like it. 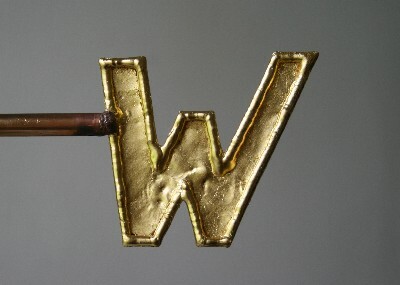 The Victorians would have considered a copper weathervane "naked" without gold. I love the way it picks up all the luscious detail on the surface of the letters. These cardinals will become like a beacon in the sun (and even the moonlight!). Our next commission, a fully gilt Hebridean lymphad (ship or galley) will be the largest gilding job we have undertaken since the gilt Kestrel Weathervane. 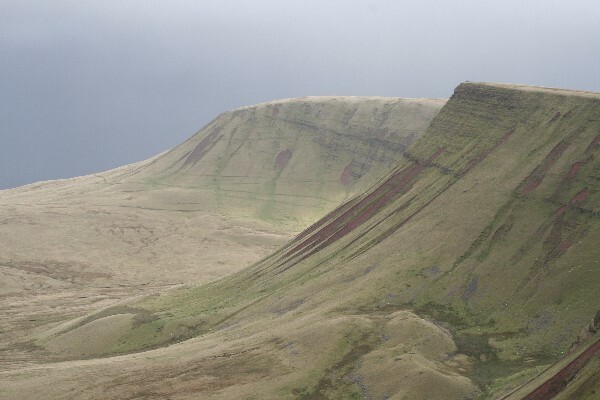 So while the size was drying, Gordon and I took the opportunity to climb the most western area of the Brecon Beacons, the Carmarthen Fans. We drove to the parking lot below Llyn y Fan Fach (a glacial lake linked to the myth of the Lady of the Lake) and then took the long way round, to walk the ridge. We didn't see a soul the whole trudge, except the farmer rounding up his sheep, and boy was it windy. Welcome to October! The sideways pelting rain was a bit of a worry, but it only lasted a minute, and then the sun shone back across the ridge giving ample warmth for sandwiches in the fresh air as we descended towards the lake itself. I love the mountains, and didn't we see a lot of red tail Kites!